Fully Automatic Multi Lane Form Fill And Seal Machine (Liquid) We are one of the leading manufacturer and exporter of the specially designed. 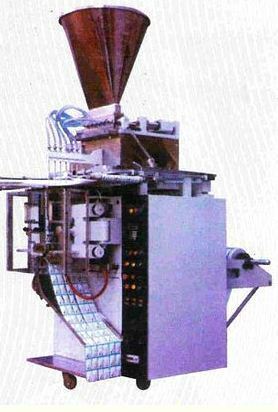 Highly versatile Fully Automatic Multi Lane Form Filling And Sealing Machine (Liquid) is designed for small consumer packs with high proactivity. The machine is equipped with PLC, AC drive and PID based temperature controllers. The Fully Automatic Multi Lane Form Filling And Sealing Machine (Liquid) is suitable for packing various type of Liquid items such as Shampoo, Creams, Oil, Ketch up and other liquids. Mr. Darshan Lal Arora started this company with a very small amount and established his cycle seat manufacturing unit under the name of Shabnam Cycle Industries in 1961. His hard work, sincerity and honesty made him to establish strong business relations within India as well as outside India. In 1978, he switched over his business into a manufacturer & exporter under the name of Shabnam Industries. With the continuous encouragement and support of his buyers and his hard work paid him to add more products to the market. Today, Shabnam Industries is one of the leading exporters of Industrial Machines. Our product range includes Tyre Retreading Machine, Lathe Machine, Automatic Flat Knitting Machine, Automatic Double Seamer, Batch Kneading Tables, Diesel Fuel Injection Pump Test Bench, Copy Turning Machines, Socks Knitting Machine, Candy Wrapping Machine, Wire Drawing Machine, Pillow Pack Machine, Automatic Blister Packing Machine, Fully Automatic Strip Packing Machine etc. Our entire product range is fabricated using quality approved raw material and advanced technologies thereby rendering maximum client satisfaction. Our products are acclaimed for easy operations and low maintenance cost. We offer the entire product range with customization facility thereby rendering maximum client satisfaction. They are available with user-friendly operations and are available in different technical specifications. We have developed sophisticated infrastructure at Ludhiana in Punjab that is outfitted with advanced technologies and modem amenities. Our unit is facilitated with hi-tech tools and machines that assist us to fabricate effective range of products to our discerning clients. We have in-house quality testing unit that is fully operational with advanced machinery and tools that assists us to fabricate durable, sturdy and functionally efficient range of products for our clients. Owing to our advanced tools and diligent workforce we are bale to deliver the entire product range on well defined time frame. Our organization is blessed by experienced and proficient professionals who hold vast industrial knowledge in their respective domain thereby assisting us to move towards the growth and success of the organization. Our employees work in close coordination with each other and carry out the entire business operations smoothly and in a streamline manner. We are blessed by dedicated technocrats who fabricate the entire product range on well defined quality standards. Owing to our strong warehousing facility we are able to safely store the entire product range and deliver them as per the requirement.